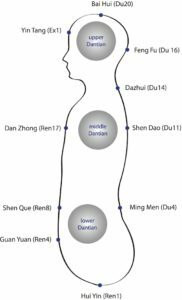 The discussion about the nature of the Dantian is old and it remains unresolved until today: Is the Dantian a bodily, material reality or an ideal concept of Traditional Chinese Medicine to explain certain psychosomatic correlations? The debate cannot simply be described as a conflict between East and West or between Tradition and Modernity. In the West, the positions differ widely: The position of Western idealism, informed by the philosophy of Enlightenment, would portray the Dantian as a (mere) concept, a kind of theory game of the mind, while Western esotericism avidly visualizes the “cauldron” in which the essences are boiled, thinking of it as providing access to sources of power which can be wielded by initiated masters to heal or to destruct. A similar divergence can be seen in Chinese approaches towards the Dantian, although one has to bear in mind that the strict separation of mind and body, which is a corner stone of Western culture, does not exist in the Chinese discourse. Therefore, all those standpoints can be described as materialist, i.e. relating to material or substance, rather than idealist, i.e. relating to thought figures. The approach of Cheng Man Ching treats the Dantian as something real, physical – and thus as a subject of scientific scrutiny. Cheng Man Ching himself thought of the Dantian as being organic, a sort of pocket, which would grow in athletes or practitioners of martial arts. He was convinced that it could be discovered and seen, if one would open the stomach of those dedicated practitioners after death. The Dantian in his teaching is neither a pure concept – something thought up by the mind – nor something mysterious, which cannot be measured. Thus, Cheng Man Ching is taking up a middle position between Chinese materialism and western scientific thought: In his view, the Dantian is decidedly physical, both in the sense of it being corporeal/bodily, i.e. forming part of the human body as substance, and of it being subject to the scrutiny of physical (as well as biological and medical) science. Because of the region in which the lower Dantian is situated, Cheng Man Ching assumed it might be connected to the Greater Omentum (omentum majus). The Greater Omentum is a sort of net surrounding the organs that forms part of the immune system. It is proved to be more developed in athletes than in non-exercising persons. Cheng Man Ching clearly never imagined the Dantian as something exclusive to Chinese (martial) arts. The connection of the Dantian to the immune system as it is portrayed by Cheng Man Ching could provide a possible link to the health effects of Taijiquan, whereas the non-existing correlation of its development with the practising of martial arts in general or Taijiquan or Qigong in specific does indicate that its development is not subject to mysterious (nei gong) techniques, but a simple consequence of coherent physical training of any (bodily) discipline. 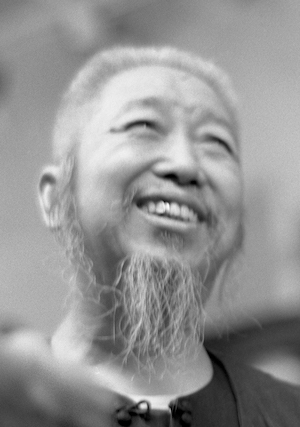 Connecting the development of the Dantian to continuous exercising, Cheng Man Ching thus stresses the aspect of self-healing as opposed to “being healed” and the aspect of hard, continuous work for one’s health as opposed to unprecedented healing abilities waiting to be revealed and embodied by a healer. In line with Cheng Man Ching’s approach, taking the claim seriously that Taijiquan is also a medical, healing art would mean not to promote its supernatural effects, but to observe, to document and to research the actual changes in the body effected by continuous training. Similar health effects of “Western” exercising – regular, reasonable exercising keeps the body fit and less prone to illnesses and infections – are also known to science. The Dantian in Cheng Man Ching’s approach is essentially “natural”, i.e. it is thought to develop within the laws of nature. Another characteristic feature is that for Cheng Man Ching the development and the effects of the Dantian are accessible by reason, i.e. comprehensible by the use of reason and other human faculties, as opposed to “supernatural”, beyond (human) explanation. This strictly non-esoteric trait in Cheng Man Ching’s approach toward the Dantian can also be seen in his view of Qi (life energy). Cheng Man Ching’s approach towards Qi associates it with momentum and movement – which can be found in the human body, but also in the circulation of the celestial bodies. Here, again, Cheng Man Ching’s view does not reflect the idea of an animated or spirited nature, as found in human-centered world views, which treat star(sign)s as mystical beings or talk about the human accessibility of cosmic powers. His approach is much humbler: He portrays humans as a part of nature, i.e. as subjected to the same basic physical laws of movement as a piece of rock in space and governed by the same biological laws of growing and decaying as other animals. In this context, Qi as a life force is not as mysterious force that can be made one’s own and then be transmitted or sent out via concentrated mental or spiritual efforts. It has still to relate to and, in a sense, remain attached to a material body as, in Cheng Man Ching’s view, is the Dantian.